Temporary Office Space During The Canadian National Exhibition? The Princes’ Gates of the CNE. One of our virtual office space clients who lives outside of the city needed a ‘touchdown’ office space while he was vending at the Canadian National Exhibition. So guess who they called? It was a no-brainer – they were already using Telsec for their virtual office and mail forwarding service. The Canadian National Exhibition (CNE) is unlike most consumer product shows – because instead of a few hundred or thousand potential customers, companies can have their product or brand exposed to millions of visitors during this three-week event. Small business owners selling consumer products can not only get exposure, but they can potentially sell a great deal of their product at the CNE. 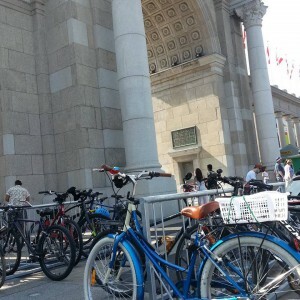 Why a blog post about this annual event in Toronto? Wherever you live, or wherever your small business does business, there is likely a provincial or local fair that you might be overlooking as a marketing opportunity for your products or services. Yes, I said services! You would be surprised what exposure to these types of events can do for a start-up or even an established small business that offers their services to consumers. It can actually generate both leads and sales. Sampling of new consumer products is one of the ways large expositions can be used to showcase your latest products – but that is not the only thing that can be offered at events such as those. Many companies use fairs and events to give introductory offers or specials, just to whet the appetite of the consumer and make some initial sales. The other reason for this blog post is that many small businesses are getting into the mindset that the only way to economically market themselves is online. Online marketing is an important component of your marketing strategy, but don’t restrict your small business to just online marketing. Putting your product or service in front of your potential clients is also a great way to grow your business. Remember, you need to know where your customers are shopping or looking for your products or services. However, sometimes you have to present them when they are not looking for your products or services. Marketers of retail products have known for years that spending money on having their products featured near the checkout can increase sales and awareness, even if the consumer does not buy it on that particular shopping trip. It is not about building the better mouse trap; it is about letting people know that there is a better mouse trap out there. While office space or virtual offices are not a product that you would likely market at a fair or consumer exhibition, they are a great fit for small business owners looking for a professional address and a facility that can offer them support. That support includes mail and reception services, on-demand secretarial services, a professional and upscale office environment, meeting rooms and other facilities that would not be financially viable in a non-business-centre environment. Virtual Office or Virtual Assistant? Why Move from the Burbs to Downtown Toronto Office Space? What Makes Good Customer Service and Exceptional Customer Service?